Mostly suitable for BMW, Ducati, Moto and many more. Please see Motorbike Fitment tab for the full list. The Yuasa B38- 6A 6V motorcycle range is a high power battery, designed for classic motorcycles. Providing high cranking power, the Yuasa B38- 6A 6-volt range is perfect for when reliability is needed. 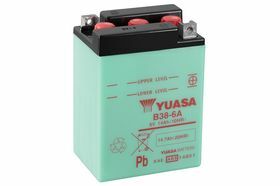 Yuasa B38- 6A battery is packed with technology for the highest reliability and cranking amps. Yuasa B38- 6A battery is built using the highest quality materials possible to give high performance and cranking power. Yuasa B38- 6A battery uses advanced lead alloy technology increasing starting power whilst keeping self-discharge to a minimum. Yuasa B38- 6A uses an active material compound to resist vibration which has excellent durability and longevity. Yuasa B38- 6A battery is supplied with an acid pack in the box which greatly increases the storage time, as the battery does not deteriorate whilst left in the dry charged state. This battery is suitable for off road jet skiing, lawn mowing as well as conventional use. Before using your battery for the first time, you must charge it for at least one hour with an independent charger or drive at least 30km once installed. The battery's robust technology, precisely tuned to the specific loads of motorcycles, provides a long life and reliable starting power for 6V and 12V batteries. The Yuasa B38-6A can be also used on a variety of other equipment such as Jet ski, Lawn Mower, Tractors, Small agricultural equipment, Pumps, Scooters and Monkey bikes.